As stated I believe the ancients, in a vacuum of scientific understanding of asteroid impacts and the resulting eruption spectacle, believed the impact event to be the work of a god and as I have shown depicted their up-raised armed various deities based on a rock art schematisation of the eruption spectacle. That they also interpreted the same mushroom cloud eruption sight as a tree and enshrined it as a ‘Tree of Life’. I believe that the ancients also mis-imagined another image from that eruption sight. They believed the mushroom cloud spectacle to be the face of a god. The mushroom cloud canopy was mis-imagined as the large brow of a face and the cloud column below was mis-imagined as the nose of the deity and so they took that misinterpretation and depicted it in their religious iconography adding eyes and a mouth to complete that particular facial interpretation. There are some instances in human physiology where human eyebrows do join but they are rare. 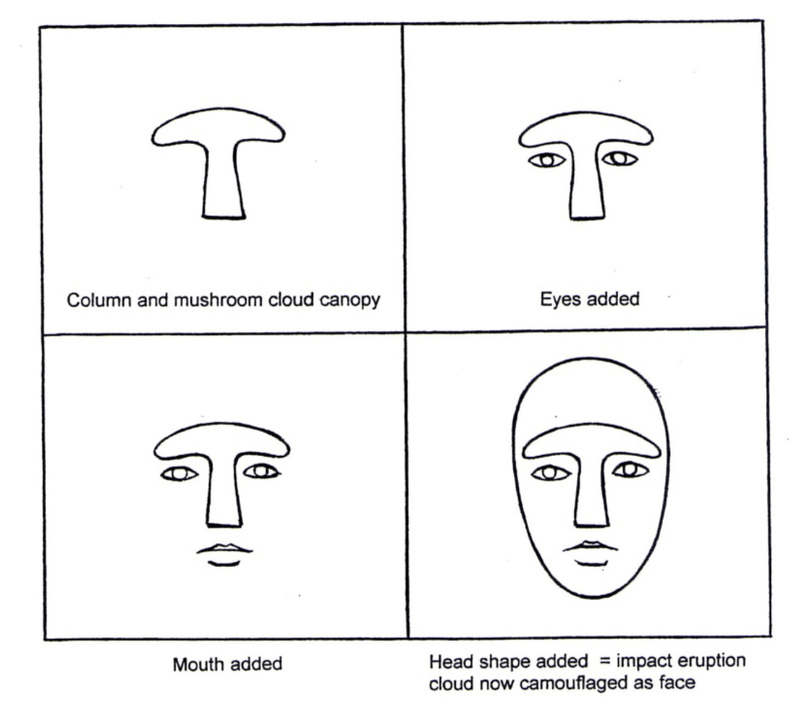 The following examples of deity faces show not only joined eye-brows and nose shapes but in most cases the artists have strived to produce an embossed look of the joined brow and nose shape to stand out from the other facial features so as to purposely highlight to the viewer the mushroom cloud shape that it actually represents and is the pertinent reason why such an embossed effect has been created. The viewer and worshipper of such joined brow, nose deity imagery was literally viewing the impact mushroom cloud ‘staring back at them’. 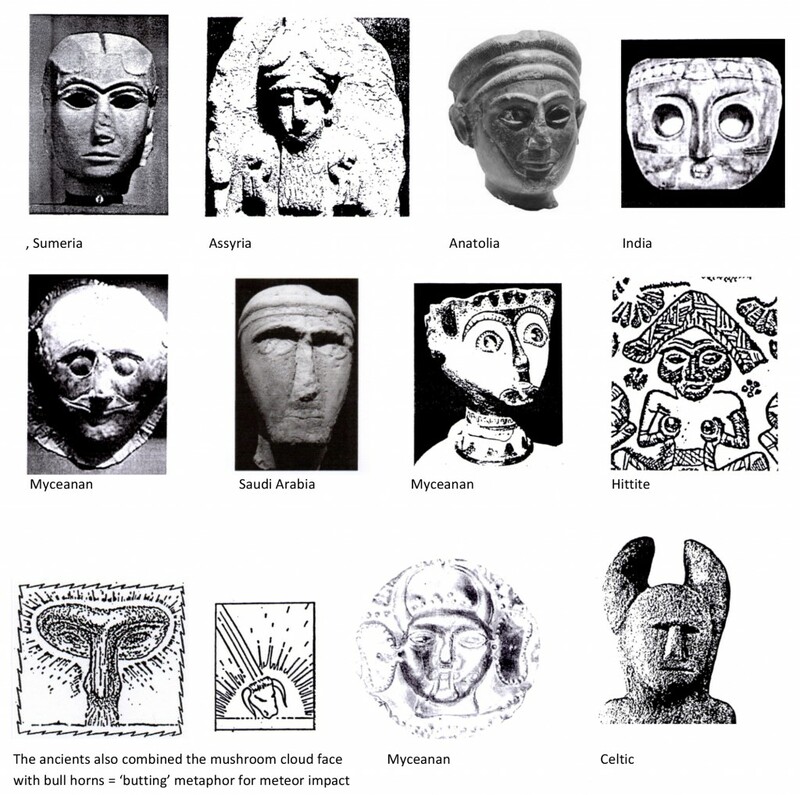 This visually confronting, ‘face to face’ state of affairs with their gods obviously deeply reinforced and psychologically fixated the various personas the ancients had projected onto such camouflaged impact cloud representations. 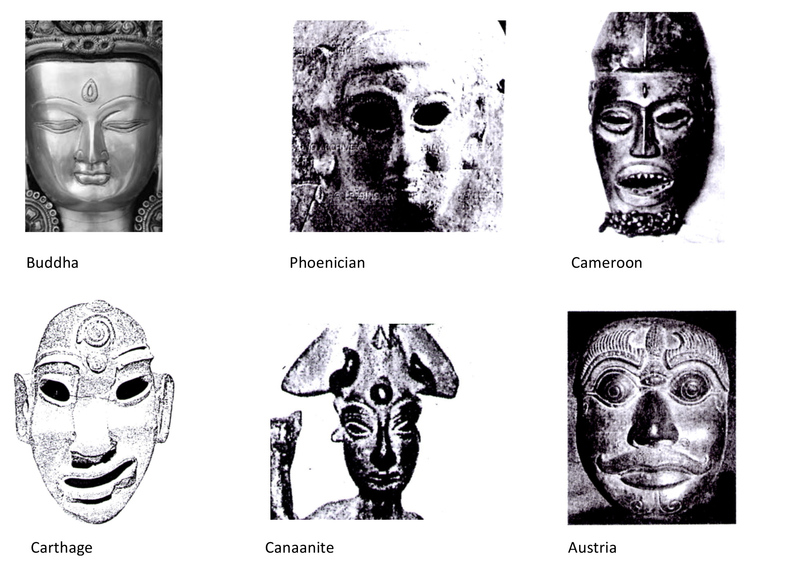 A facial interpretation enabled the ancients to better view the deity as a ‘living, communicative entity’. 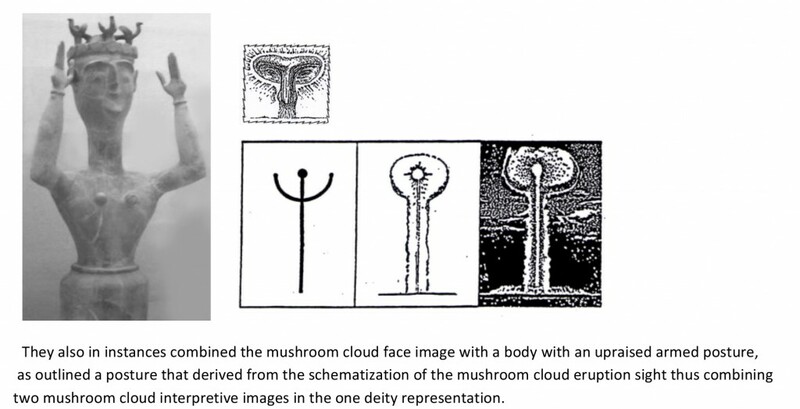 When the ancients mis-imagined the mushroom cloud as a face then it automatically opened the door for another visual impression to be interpreted from the sight. The erupting mushroom cloud contained the blazing fireball at its centre. It therefore would have been positioned directly in the lower middle forehead of the imagined face projected onto the mushroom cloud. The fireball was then mis-imagined in instances as another eye, a mystical eye. This then is the origin point for the famous third eye found especially in Indian religion and beloved by mystics down the ages. In Indian myth we are told the third eye of Shiva ‘burned Kama (desire) to ashes’. The descriptive use of the words ‘burning and ashes’ in this myth make contextual sense for the ‘eye’ mentioned here is the blazing, incandescent fireball at the centre of the mushroom cloud ‘forehead’.